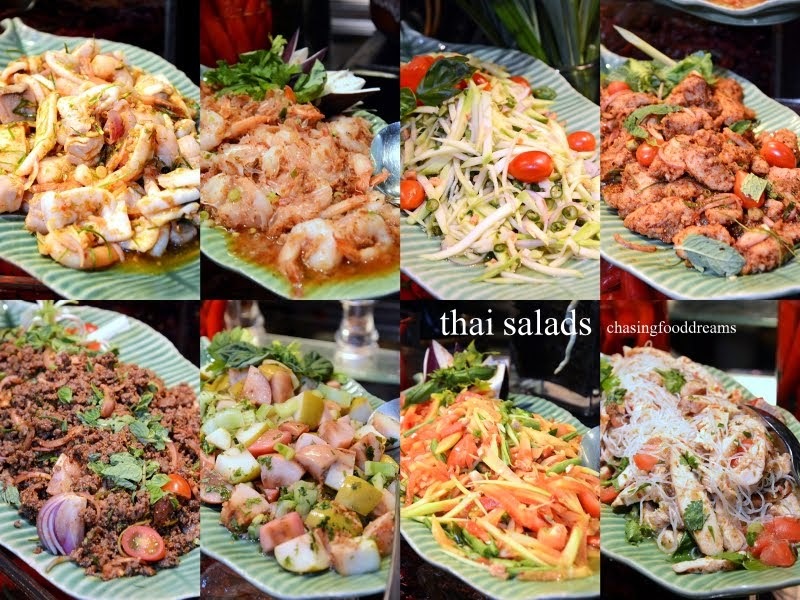 Bringing Authentic Thai Flavors to the City! I haven’t been back for a while and I was pleased when the invite was extended to check out their promotion. The Mill at Grand Millennium Kuala Lumpur was one of my very first few reviews when I first started this blog. I do admit to having a soft spot for this restaurant simply because of its famous buffet spread. One evening, I maneuvered my way through the traffic in the city for its Land of Smiles promotion. The Mill Café is an all-day dining restaurant serving up sumptuous spread of local and international cuisine. 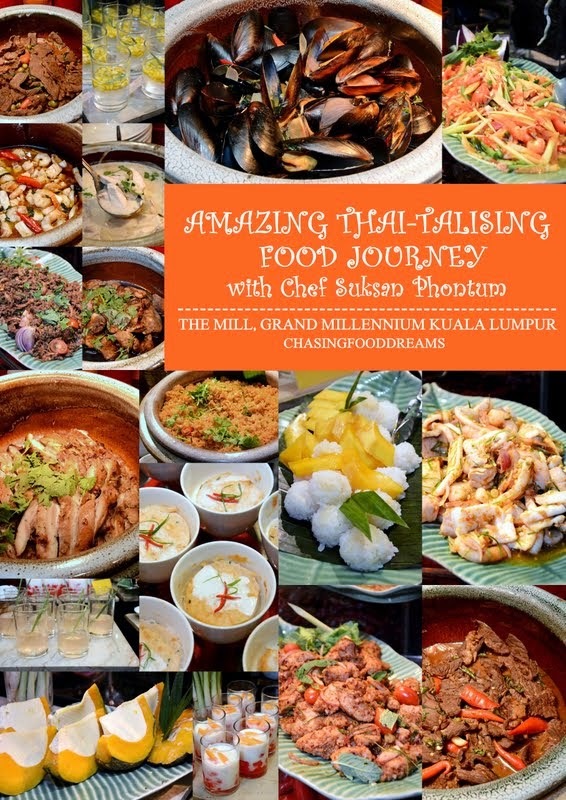 This month, The Mill brings cuisine from Thailand with its theme of ‘Amazing Thai-talising Food Journey’ closer to all here. Commencing from April 23 to May 25 2014, diners are treated to one of the most beloved cuisines in Malaysia. Everything about the neighboring country is an art form by itself. The Thai cuisine together with its culture and economy holds a representation of balance of everything sweet, spicy, sour, salty and bitter in life. 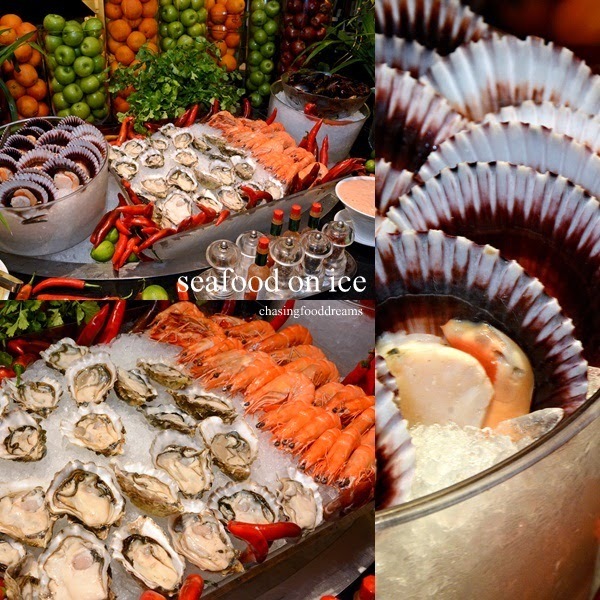 To ensure the authenticity of flavors, Grand Millennium Kuala Lumpur has brought in a culinary team from its sister-property Grand Millennium Sukhumvit Bangkok to prepare the tantalizing buffet spread. Working closely with Executive Chef Laurent Lherisson, Chef Suksan Phontun (Noi) has whipped up a kaleidoscope of Thai dishes that will have diners salivating with much delight. In conjuction with the commencement of this promotion, Grand Millenniium Kuala Lumpur Management, Peter Gibbons, General Manager and Trudy Moreno, Director of Sales & Marketing had the honour of hosting His Excellency Krit Kraichitti, the Ambassador of Thailand as well as dignitaries from the Thai Embassy to the ‘Amazing Thai-talising Food Journey’ dinner. During the dinner, diners are entertained by Thai classical performers as well as a Muay Thai demonstration. It was an exciting evening as Thai dancers were graceful and dressed in their national costumes. Following the graceful performances, Muay Thai team took the stage to show off their Thai martial art skills as they combat each other depicted through a story. Without much further delay, here is a preview of what the ‘Amazing Thai-talising Food Journey’ has to offer by Chef Suksan Phontun and the kitchen tea. Though Thai cuisine features many soups in their repertoire, the most classic ones are Tom Yam Kung and Tom Kha Gai. Savor both Tom Yum Seafood Soup and Coconut Chicken and Galangal Soup at The Mill. The Tom Yum is spicy, sour and a little creamy while the Tom Kha Gai has a sweet coconut broth spiced up with herbs and chili. Both are equally delicious! Main course features lots of authentic dishes to be savored on its own or with rice. There are just so many choices that I didn’t even have the stomach space to enjoy them all though they looked mighty tempting. Enjoy the Tom Yam Fried Rice and Seafood Fried Rice with Cashew Nuts Fried Chicken, Steamed Garoupa with Spicy Seafood Sauce, Stir Fried Beef Tenderloin with Red Curry, Pad Krap Pao – Wok Fried Seafood with Hot Basil, Stir Fried Chicken with Garlic Pepper Sauce, Stir Fried Minced Beef with Hot Basil and Chili, Baked Mussel with Thai Herbs, Roasted Chicken Lemongrass, Chicken Coconut Thai Green Curry, Green Pepper Beef, Fried Red Snapper with Thai Celery, Gaeng Phed Ped Yang – Barbeque Duck Curry, Wok Fried Fresh Clam with Smoked Chili Paste, Thai Massaman Chicken Curry, Steamed Sea Bass with Spicy Lime Sauce, Sauteed Squid with Salted Egg and so much more. 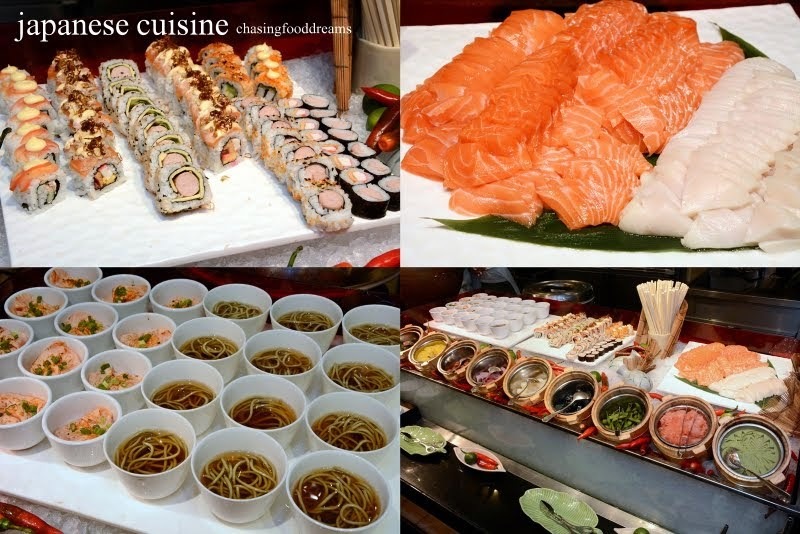 Besides the Thai spread, there are the usual Japanese Station, Seafood on Ice Station, Indian Cuisine, International Cuisine and local dishes as well. The Japanese station is laden with favorites of Sashimi, Sushi and Soba Noodles while the Seafood on Ice Station features succulent Fresh Oysters, Poached Prawns, juicy Poached Scallop and Mussels. 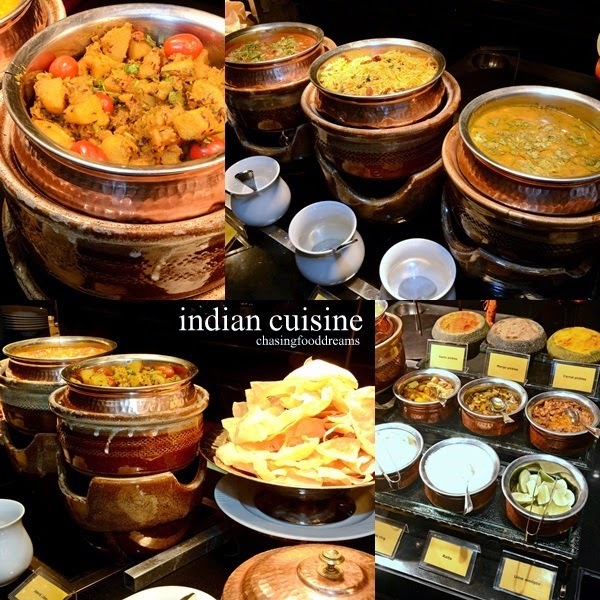 The Indian cuisine station is also a must-visit with Chef Markhan’s famous Tandoori, Naan and other robust curries and pickles. International corner has Pizza, Satay, Seafood and Meat dishes and more. Though I highly doubt one will have room for desserts but one simply must, especially if you are a Thai dessert fan. Chef Suksan has filled the station with authentic Thai desserts such as Mango with Sticky Rice, Tab Tim Krob, Banana in Sweet Coconut Milk, Thai Pumpkin Custard, Lemongrass Jelly in Ginger Syrup, Fresh Corn in Rose Syrup, Fresh Coconut Jelly and more. 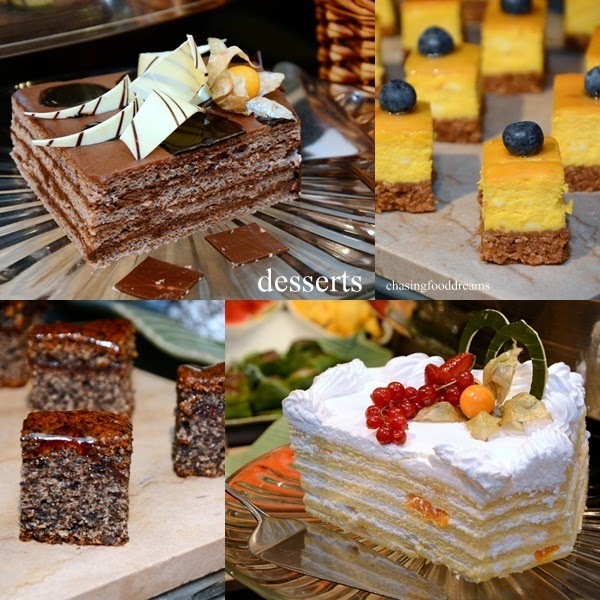 There are also Fresh Fruits, Chocolate Fountain, Ice Cream, Cakes, Puddings and local Kuih. The ‘Amazing Thai-talising Food Journey’ promotion is available every Wednesday, Friday and Saturday from 23rd April to 25 May 2014. Available from 6.30pm to 10.30pm, the buffet is priced at RM88++ per person for adult and RM44++ per child above 6 years old. Diners patronizing the promotion will also stand a chance to win attractive prizes in a Luck Draw. Prizes include return air tickets to Bangkok courtesy of Thai Airways and luxurious stays at Millennium Resort Patong, Phuket and Grand Millennium Sukhumvit, Bangkok.